In CrossFit it has become vital for athletes to obtain a proper handstand. Handstand technique is vital for Crossfitters. 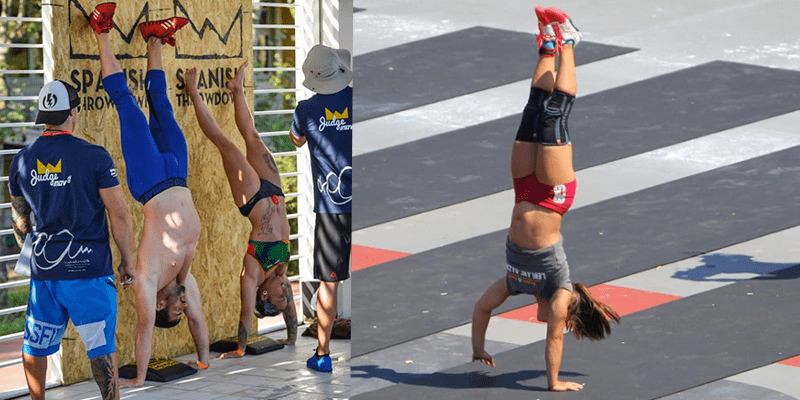 The last invitational was a testament to this, with Dave Castro stating that we will be seeing more of the handstand walk obstacle course in the future. However it has also long been expressed by CrossFit CEO Greg Glassman, that the handstand is a crucial part of the sport. As being upside down is a large component of CrossFit events, being competent at it is vital for competitions. However the ability to be upside down is also a great skill to develop for the everyday athlete. It develops body control and awareness and can be a great exercise for the shoulders and wrists. There are many ways to be upside down; handstand walking, handstand push-ups, ring handstand push-ups or free standing handstands. No matter the exercise they all start of with the basic handstand. If the basics are on point, it becomes easy to build complexity from there. The best individuals in handstand hold, handstand push-ups etc. are usually the athletes that have spent a considerable amount of time engraving the basics. The athletes with a gymnastic background paying homage to this, most notably Katrin and Annie the 2 Icelandic females. A handstand is a skill that needs time to develop. Therefore within The Progrm we integrate handstand exercises to our gymnastic warm-ups, as they not only develop the handstand, but also have a good transfer to other movements, especially overhead positioning. How many athletes do you see holding their wrists after practicing handstand walking? It is vital that our joints are able to handle the compression placed on them. If they are not used to this load it can lead to injury and soreness. Step 1: 60 seconds comfortably in a push up position. Step 2: 60 seconds comfortably in a handstand box hold. Step 3: 60 secs in a wall facing handstand hold. The ability of the joints to express the range required for proper alignment is vital. The most important joints for a correct handstand are the wrist and the shoulder. Is the ability to use only the wrists and fingers to balance the body. Just like your feet are your contact when standing upright and you need a solid base, your hands are your contact when being upside down. A great way to practice this awareness is through the “Crow pose”. During this specific exercise you will have your centre of gravity much closer to the floor, thus allowing you to isolate the balance to the wrists and fingers, without the need for full body control. Once you have advanced to joint stacking step 3 (Wall facing handstand hold), you will now learn how to feel the macro-balance. There are two main locations of macro-balance: The hips and shoulders. There are two directions where the balance will go: Toe side or Heel side. Basically falling forward or falling backwards. This is one of the harder exercises as it requires good body awareness whilst upside down. Step 1. Walk up into a wall-facing handstand about 10 – 15 cm away from the wall. Lock the shoulders in place and the only movement should be coming from the lower back and hip. Step 2. Start tilting your pelvis anteriorly (arch your low back), you will notice your lower back curve getting bigger. Step 3. Your toes will start to leave the wall, as they do, you will need to tilt you pelvis back posteriorly (hollow your low back) – the correct position. Take your time in this correction. A handstand is a skill that needs a lot of time to develop. Work consistent on it and don’t forget to have some fun along the way. Happy hand-balancing!